David Noble conceived and led the design and development at IBM of the 8-inch flexible “floppy” disk and associated disk drive mechanism. In 1967, when punched cards were still being used for data entry and software programming, Noble was asked to develop a new way to load microcode into IBM’s mainframe computers. 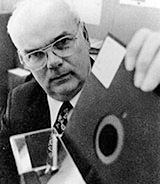 He proposed an entirely new device, an 8-inch-diameter flexible “memory disk.” Besides inventing the device itself, Noble and his team enclosed the disk in a plastic sleeve lined with fabric that removed dust particles from the surface as it rotated, providing an ease of handling and protection that led to widespread acceptance of the floppy disk. The original flexible disk drive introduced by IBM in 1971 launched a major new segment of the computer industry, enabling the personal computer revolution and emergence of an independent software industry. The floppy disk icon became a universal symbol for saving files. During World War II, Noble was recognized for invaluable service to Navy code-breaking activities.